You are here: Home / News & Reviews / Clew News / Who does what in the house? Who does what in the house? Take a look at these recent statistics published by the Organisation for Economic Cooperation and Development (OECD) on how men and women in different countries spend their time when they’re not working. It’s easy to spot the “baddies” – the smaller the man the less time he spends on housework and caring for his family. 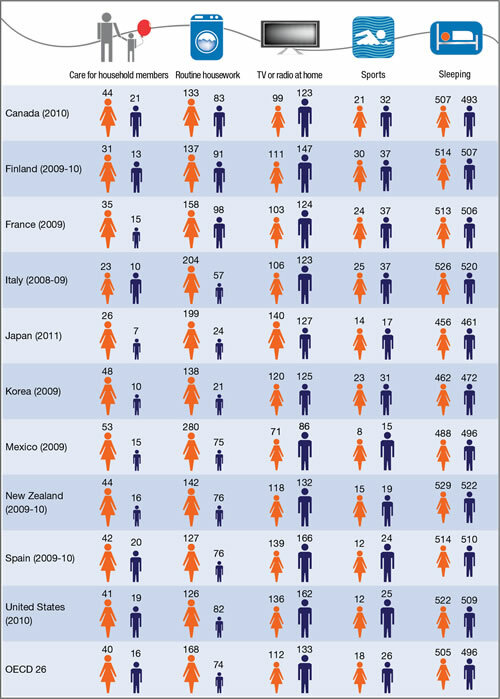 The OECD 26 average shows that women put in more than twice as much time on care for household members and routine housework than men do, and adding up paid and unpaid work, women work 2,6 hours more per week than men do. We’re more equal when it comes to leisure activities, yet men fit in extra minutes of leisure each day while women spend more time doing housework. French and Italian women spend the most time on personal care, including eating and sleeping (755 and 697 minutes respectively), but French and Italian men certainly keep up with them, spending about the same amount of time on personal care! On the upside, Scandinavian countries aim to balance work and family life for both men and women. All in all still a way to go towards gender equality, and still a need for International Women’s Day!